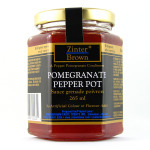 Zinter Brown Horseradish Jelly Hot Pot is a unique taste infusion of horseradish and our popular Red Pepper Pot. Fresh horseradish, plump red peppers, sugar, water, pectin, vinegar... wholesome ingredients in just the right combination creates a jazzy flavorful condiment. 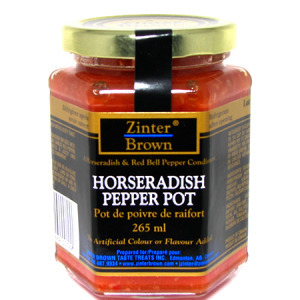 Add Zinter Brown prepared horseradish sauce to stews or chili. 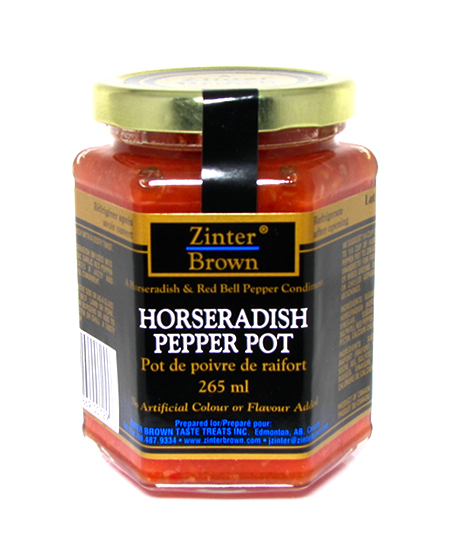 Use our bottled Horseradish Hot Pot as a glaze or marinade on roast beef, lamb or pork. Horseradish dressing incorporates a zesty twist into spreads or appetizers. 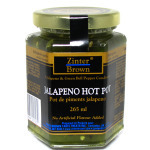 Every shrimp begs for the company of Zinter Brown horseradish dipping sauce. For further inspiration, visit our recipes pages: beet salad, prawn & avocado salad and lobster tail recipe. And please, send us some of your favourites! 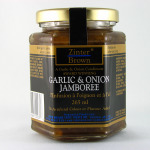 Order Zinter Brown horseradish jelly by the jar, or in a gift basket or gift pack. No other prepared horseradish sauce will ever do!